Holder didn’t mention the American Legislative Exchange Council (ALEC) or the National Rifle Association by name, but his words are a reminder of the amount of blood on the hands of both groups. Attorney General Eric Holder on Tuesday strongly criticized stand-your-ground laws that allow a person who believes he is in danger to use deadly force in self-defense. Holder said he was concerned about the case of Trayvon Martin, in which George Zimmermann was acquitted of second-degree murder and manslaughter charges, and said the Justice Department has an open investigation into what happened. Such laws “try to fix something that was never broken,” he said. Contrary to claims that it had nothing to do with the Zimmerman verdict, Florida’s “stand your ground” law relates directly to both the murder of Trayvon Martin, and the acquittal of Zimmerman for Martin’s murder. Zimmerman’s defense steered clear of a “stand your ground” defense, but the judge explicitly mentioned “stand your ground” in her instructions to the jury. Even before Zimmerman was arrested and charged, 44 days after ending Trayvon Martin’s life, “stand your ground” also played a role in the decision not to arrest Zimmerman that night, by making it difficult to arrest anyone who claimed self defense. Apparently, that was the intent. Any of these assumptions should have been enough for Zimmerman to stay in his truck, but thanks to “stand your ground” Zimmerman had no “duty to retreat” or stay in his truck until the police arrived. In fact, the law allowed Zimmerman to escalate his encounter with Martin, until he finally felt a need to “stand his ground.” Florida’s concealed carry law meant Zimmerman had all the firepower he needed to “stand his ground.” On that Feburary night more than a year ago, it all made for a lethal combination. In March 2012, CMD reported that NRA lobbyist Marion Hammer helped draft the Florida law in 2005, and “stared down legislators as they voted” to pass it. 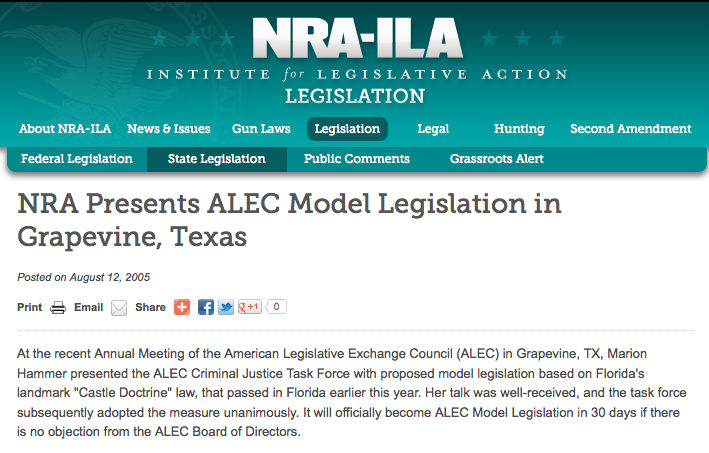 Just a few months later, Hammer presented the bill to ALEC’s Criminal Justice Task Force (now known as the Public Safety and Elections Task Force), and the NRA boasted that “[h]er talk was well-received.” The corporations and state legislators on the Task Force — which was chaired by Wal-Mart, the nation’s largest retailer of long guns — voted unanimously to approve the bill as an ALEC “model bill.” Since becoming an ALEC model it has become law in dozens of other states, and the number of homicides classified as “justifiable” has dramatically increased. And the NRA did its bit for concealed carry. For many years, until this spring, the National Rifle Association (NRA) actually co-chaired the ALEC “Task Force on Public Safety and Elections.” (The election bills are discussed in the section of this site titled “Democracy, Voter Rights and Federal Power.”) ALEC bills include “model” legislation that advances the constitutionality of an individual’s right to bear arms, an argument vindicated by a recent ruling of the U.S. Supreme Court. The legislation also would likely benefit the firearms industry closely connected to the NRA. Oppose efforts by law enforcement to use their purchasing power get gun manufacturers not to market guns or ammo likely to be used against police, like “cop killer bullets” that pierce armor. Trayvon Martin’s isn’t the only blood on the ALEC’s or the NRA’s hands. Jordan Davis is already being called “the next Trayvon Martin,” after he was shot and killed in an argument over loud music, at a Jacksonville gas station. And, like Zimmerman, it seems Michael Dunn will plead self-defense in his Florida trial. Rodrigo Abad Diaz, a 22 year old Cuban immigrant, was on his way to pick up a friend to go ice skating. He had his girlfriend and his 15-year-old brother with him. But Diaz’s GPS took him to the wrong address. Diaz was shot and killed by 66-year-old Phillip Sailors as he tried to leave the driveway. Gwinnett County man is accused of shooting and killing a man who friends said pulled into the wrong driveway. Phillip Walker Sailors, 69, of Lilburn, was booked into the Gwinnett County jail Sunday afternoon and charged with murder for the death of Rodrigo Abad Diaz, according to jail records and his arrest warrant. Diaz, 22, was shot in the head Saturday night as he tried to drive away from Sailors’ home on Hillcrest Road in Lilburn, the warrant states. Friends of Diaz, of Duluth, told Channel 2 Action News that he and others were trying to find a friend’s house, but their GPS instead led them to the home on Hillcrest Road, off Indian Trail Road. After seeing the car in his driveway, Sailors came out of his home, went back inside, then came out again with a gun and shot in the air, Yeson Jimenez, 15, told Channel 2. Jimenez said he and his brother were in the car with Diaz, along with a female passenger. Diaz tried to drive away, but Sailors shot again, striking Diaz in the head, according to police. An attorney for Sailors told Channel 2 the man shot because he feared his life was in danger. It does not stop with Trayvon Martin, Jordan Davis, or Rodrigo Diaz. ALEC and the NRA have a lot more blood on their hands. How many people have died because ALEC and the NRA have made it easier for more people to get guns, legal for more people to carry concealed weapons in more places, and easier to “shoot first and ask question later”? Will ALEC and the NRA ever be held accountable?